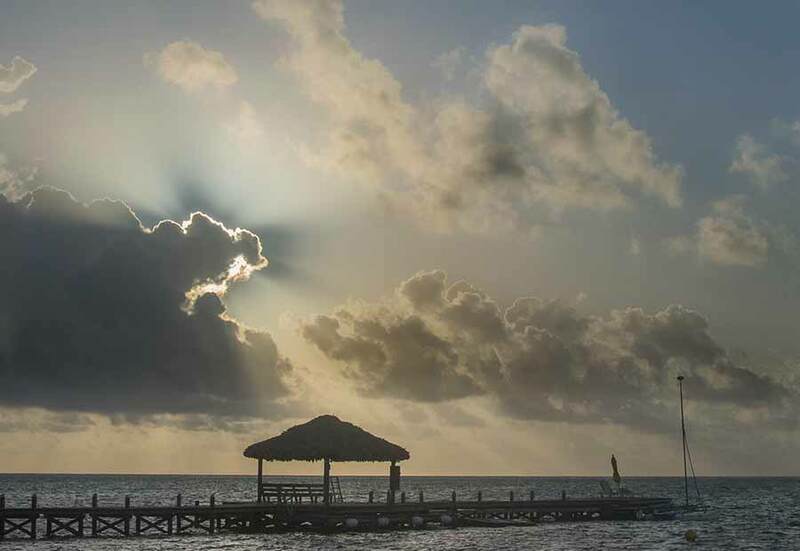 Belize NMS: Mainly fair weather conditions will prevail during today and tonight. 24-hour forecast: Sunny skies with a few cloudy spells today and partly cloudy skies tonight. Showers will be generally isolated, except for a few more over inland areas this afternoon and along the south coast tonight. General Outlook: Some cloudy spells with a few showers or an isolated thunderstorm developing mostly over northern and inland areas Tuesday and along the coast and over the south Tuesday night. Today E 5-15 kts Light Chop 2-4 ft ISOLATED SHOWERS. Tonight E-SE 10-20 kts Choppy-Moderate 3-6 ft A FEW SHOWERS SOUTH. Tomorrow E-SE 10-20 kts Moderate 4-6 ft A FEW SHOWERS MOSTLY NORTH. Outlook E-SE 10-20 kts Moderate-Rough 5-7 ft A FEW SHOWERS AND ISOLATED THUNDERSTORMS MOSTLY SOUTH. An upper level trough extends from a SE coastal Georgia cyclonic circulation center, through the eastern Gulf of Mexico, through the Yucatan Peninsula, into the NW corner of the Caribbean Sea, across Honduras, into central sections of Nicaragua. Precipitation: isolated moderate to locally strong rainshowers cover the Caribbean Sea between 70W and 86W, in the Atlantic Ocean from 20N northward from 70W westward, and in the Gulf of Mexico from Florida to 90W. scattered to numerous strong rainshowers are from 08N to 15N between 75W in coastal sections of Colombia, and 84W in coastal Nicaragua. 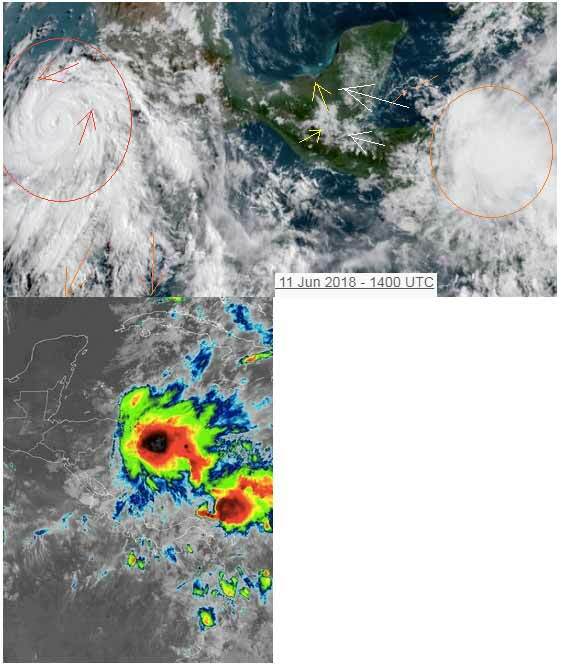 The monsoon trough is along 09N/10N between 74W in Colombia and 84W in Costa Rica. Precipitation: scattered to numerous strong rainshowers are from 08N to 15N between 75W in coastal sections of Colombia, and 84W in coastal Nicaragua. The 70W tropical wave will continue to move westward, through the central Caribbean Sea, reaching the western sections of the Caribbean Sea on Tuesday. A second tropical wave will enter the eastern Caribbean Sea late on Tuesday. A tight surface pressure gradient will support strong trade winds across the south central and southwestern Caribbean Sea through Monday, with these conditions spreading north across the central Caribbean Sea by the middle of the week. Locally strong trade winds will develop across the tropical waters to the east of the Windwards on Monday night. The strong conditions will spread westward across the southeastern Caribbean Sea on Tuesday night and Wednesday. On Ambergris Caye this morning The wind is from the East at 12 mph making the sea around our barrier reef moderately choppy. The expected high today is 88 f.
That HURRICANE BUD now up to Cat.3, is having effect on our weather. Basically giving us a fair amount of sunshine and relatively clear skies, at least from the high-level clouds. 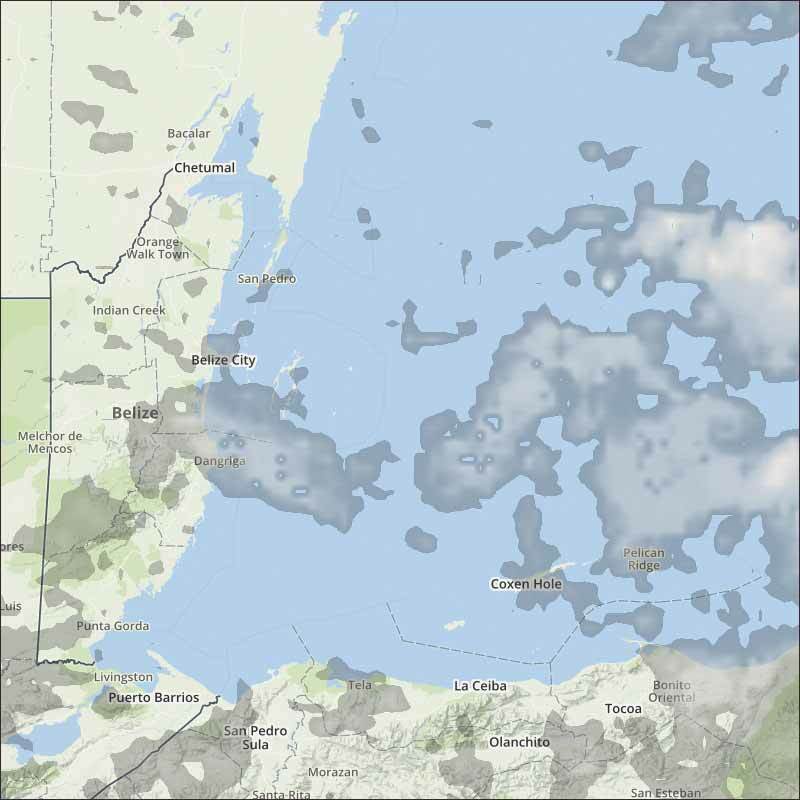 But there has been a massive ITCZ swellup out in the Caribbean, some of its throw-off cloud is coming to Belize. There is very little rain around Belize. Looks like today will have a fair amount of sunshine, but white clouds already developing, small chance of rain. We have already had two major Cat.4 Hurricanes in the Pacific just to the west of Mexico and not all that far from Belize. Both have spun up very, very fast. 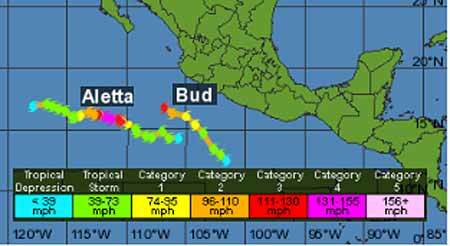 ALETTA has now rapidly dropped, to only a Depression, but HURRICANE BUD not far away, is rapidly intensifying. That now up to Cat.3, is having effect on our weather. Basically giving us a fair amount of sunshine and relatively clear skies, at least from the high-level clouds. But there has been a massive ITCZ swellup out in the Caribbean, some of its throw-off cloud is coming to Belize. There is very little rain around Belize.